We all enjoy a great cliffhanger. That feeling of being on the edge of your seat is exhilarating. You must know how the story ends before you can move on to other things. The cliffhanger is a great way to keep an audience wanting more. It’s how many of us get caught up in binge watching TV shows. This storytelling device is great for inspiring presentations and impactful speeches. Here’s how to construct your content to build up to a cliffhanger. The essence of building up to a cliffhanger is storytelling. Your speech should include a story that will make your audience invested in your message. The neuroscience of stories shows that people will feel emotionally connected and related to what you have to say. This is why stories are so effective for speeches and presentations. You can frame your presentation with a story at the beginning and the end. Use a character or a scenario to set the scene for your content. Then introduce your ideas, concept or solutions. Circle back to this story to conclude your presentation, and this is where your cliffhanger comes in. You don’t have to reveal the end of your story to end your presentation. Use the final chapter of your story as an incentive to get follow calls, emails or conversations. Use your story throughout your entire presentation, instead of only at the beginning and end. You can introduce your ideas through the different chapters in your story. This works for a company origin story or a personal experience the drove you to take action. Like the Framing option, you also don’t have to reveal the conclusion of your story at the end of the speech. Instead, inform your audience that you will be sending them the conclusion in an email. You can soft sell your product or offer your services through a series of communication following your presentation. For your cliffhanger to have a full effect on your audience, there needs to be tension. You can build tension by setting up your content in a specific way. Set the scene with an introduction to two scenarios: a world where a problem exists and a world where it doesn’t. Then you can incorporate your story and solutions. Make an impactful ending by asking your audience again what kind of world do they want to live in. But create a cliffhanger by holding back how to make this reality possible. Instead, promote your product or enlist your audience to contact you for more information on your solution. Begin with the problem your audience is experiencing. What’s their struggle? Then talk about your personal experience with this same problem. The middle of your presentation can be you journey to how you decided to solve the problem once and for all. Finish your presentation with your solutions, except keep something a secret for your cliffhanger. This could be an additional offer or service. How you deliver the cliffhanger will either help or hurt your presentation. You should put in the most amount of energy into your conclusion. Here are some tricks to get the most impact. As you build up to the finale of your presentation, take a pause before you leave your audience wanting more. The power that a moment of silence can have on an audience is hefty. This trick will draw your audience in, eager to hear every word. Use this to drive home all impactful speeches. It’ okay to repeat the same word or phrase during a presentation, because you want your audience to walk away remember your message. Use a theme to frame up your entire speech and hammer in the final nail of your presentation with this theme. Your audience will not only walk away wanting more, but remembering the big idea behind your message. Don’t let your big finale fall short. 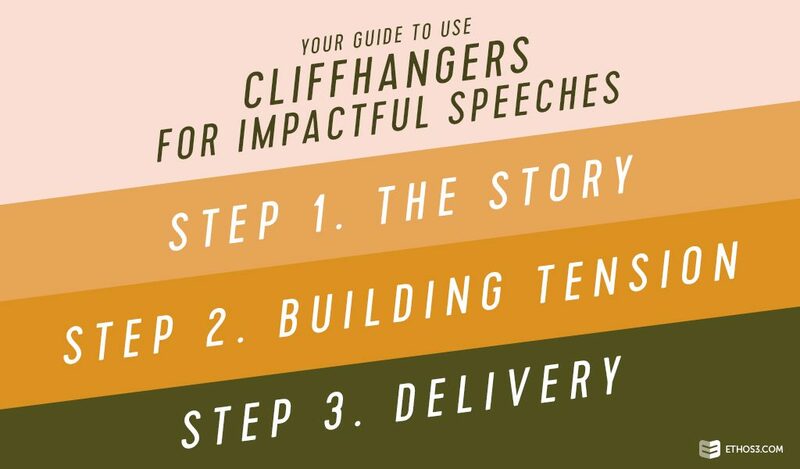 Follow this guide to build up to a cliffhanger for successful and impactful speeches. For more presentation tips and tricks, check out these posts from the Ethos3 blog.